A Resume Template is a form which may be used by job hunters to create a document sent to potential employers. This is a specific type of document and it must include the information a hiring entity expects from a candidate regarding that applicant’s goals, skills, employment history, and academic credentials. Recruiters require this information in order to properly assess a candidate’s viability for the position that must be filled. This will avoid a bad match or an unproductive interview which is unfavorable for both parties thus, it is important to be very accurate when composing the content of a resume template. 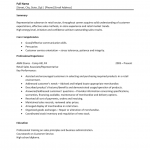 The appearance and content of this document will define a particular job hunter to a hiring entity. Thus, it should read professionally, look flawless, and be accurate. The content (which the user must compose) will be divided into sections with appropriate headings. This begins with an area for one’s name and contact information at the top of the page. The following sections will have headings such as Objective or Profile, Qualifications, Professional History, Education and sometimes an area for Additional Skills. While these sections may not necessarily have the same heading in each resume, they will appear in some form on all good resumes. A template is basically a blank form which may be filled out. 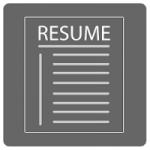 A job hunter using a resume template will be filling out a resume…just with the help of predefined headings to follow and with the formatting built in already. Once this form has been completed and checked over it may be used as a master document of sorts. The master document will give the user a source of basic content for future employment opportunities that require a few revisions to the job hunter’s current resume. More importantly, this will speed up the process of creating a specialized resume for a potential employer because the headings and formatting in the original document are present in the blank template form. This enables an applicant to focus their efforts mainly on content revision and produce a new resume relatively quickly. A high quality resume inquiry made soon after a job listing has been posted will help the applicant gain an in-person interview provided their skills and experience fulfill a job’s requirements. To gain the _________ position with _________. To utilize my skills for the benefit of the _________department while representing _______ in an impressive manner to all outside parties. To provide _________support for the ________department as a flexible team player.